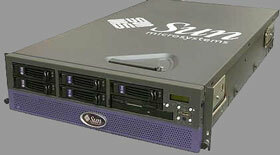 The SUN Fire V20z (A55 Stinger 2P) and V40z (A57 Stringer 4P) are 1U and 3U entry level servers, respectively. The V20z and V40z were built on AMD Opteron platforms rather than SUN SPARC CPUs. The V20z supported up to (2) AMD Type 252 2.6 GHz CPUs while the V40z supported (2) or (4) AMD Opteron 880 Dual Core CPUs operating at 2.4Ghz when using a memory / CPU daughterboard. (4) DIMM Slots are available per CPU in both models. The V20z accepts up to (8) 2GB Registered PC2700 DIMMs while the V40z accepts up to (16) 4GB Registered PC3200 DIMMs for a total of 64GB of memory. (5) Ultra320 Disk Modules can be installed in the front hot-swap bays of the V40z. (2) Drives may be installed in the front of the V20z. The largest capacity drive recommended by SUN is 300GB 10K.